Writing is a great mystery and a chance to show the world how your thoughts look like for real. There are many people, who face the urgent need to perform great writings, but they cannot even form words into proper sentences. The well-written paper requires significant writing talents and a good knowledge of the topic you try to describe. The modern research papers and academic works require a great knowledge of the existed formats and styles as well. APA format is one of the modern essay formats that allow delivering great final papers. This formatting style is important for students, researchers and other people who try to write essay papers and more complicated writing works. Every person, who want to provide an outstanding essay paper, needs to check all the APA tips and guidelines in advance. What is essay format APA? APA is a professional format used for delivering paper works, mostly in psychology. This abbreviation stands for the American Psychological Association. Nowadays, the sphere of APA usage had gone far beyond the psychology papers only. 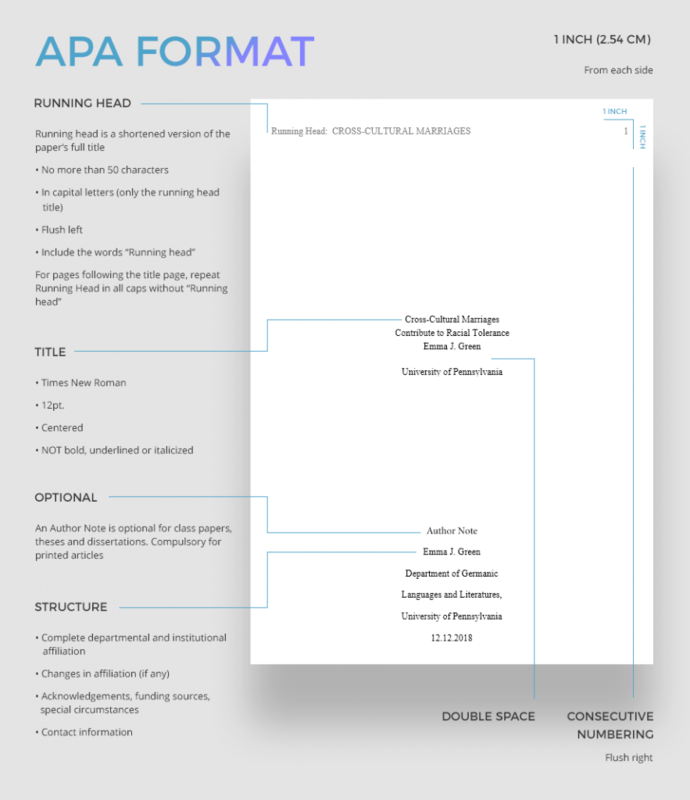 Many modern students and researches use APA for formatting own writing works. The Publication Manual of the APA contains all the guidelines and rules of the mentioned formatting style. The manual reveals the main rules and guides how to format your paper according to APA format requirements and standards. You can find all the details about APA in the library, a bookstore, or on the Internet. Following the guidelines, you will be able to provide a properly written and formatted final paper. Writing your APA paper, make sure to deal with every basic element of APA format beforehand in order to provide an excellent final paper. Make sure to format your paper core elements according to major APA format requirements and standards. You need to remember a few tips of APA page setup to use while writing your essay paper. First, use 1-inch margins throughout the entire document. Secondly, choose the readable and legible font like Times New Roman 12pt. You may choose any other appropriate fond, especially if your tutor has mentioned it in his requirements. Third, use double spaces once writing the entire document. The head of your document must be justified with the left margin when the entire title should be less than 50 characters. Make your head quite informative to let the reader know what the entire paper is about. Make your running head short and clear. When placing the numbers of the pages, include the page number on every single page in the header. Make the numbers right justified. Center all the elements on the top half of the cover page, and use double spaces. APA rules and regulations reveal a need of a short essay paper’s summary called the abstract. This text mostly describes, in brief, your main topic, methodology, core purposes of the research work, and its results. The abstract allows informing readers of your essay paper main topic and the ways you have chosen to research it. When formatting, center the abstract at the top of the page. Use double spaces. The first line needs to be left justified. You can also use keywords under your Abstract if needed. It is easy to type “Keywords” word and write down a few important keywords. The title of the paper signifies the beginning of the entire essay paper, thus, it needs to be clear and informative. According to APA format requirements, the paper has both running head and the title. The introduction is another essential element of the essay paper. Be sure never to label it since it is one of the biggest mistakes made by writers. The introduction is the first section of the paper where the following story begins. Every separated section of your paper requires a heading. When handling the headings, make sure to check all the types of headings, which include main headings, subheadings, and so on. Such headings like “Methodology” and “Reference List” are main headings. When dealing with quotations, make sure to create a block quotation if your quote is longer than 40 words in length. The block quotation requires a new fresh line. Do not use any quotation marks. You can check any APA formatting example online to see how the quotes look like in APA format. Center the “References” word and place it on the top of the page. Do not make it bold or italics. Order the sources in alphabetical order. Use double spaces throughout the page. Justify every new line with the left margin. Once dealing with the reference list, you have done the entire APA formatting. Surely, it takes time to provide proper headings, numbers of pages and main body parts, but with the all requirements followed, you will be able to submit a perfect essay paper. To ease the entire process of APA formatting, use the last updates of the Publication Manual of the APA. You can find it with all the details about APA format in the library, a bookstore, or on the Internet. Following the guidelines, you will be able to provide a properly written and well-formatted final essay paper. This article will be also very helpful since here you can find numerous APA formatting tips and guidelines. You can use it as the source of additional information, which will help you to submit the perfect APA paper to your tutor or professor.